When you're a public official who's already captured the nation's attention, and you decide to resign, a speech is called for. But what if speaking isn't really all that possible for you, physically? That was the challenge for U.S. Representative Gabrielle Giffords, who was shot in the head and spent a year recovering before she decided to resign from Congress to focus on her recovery. Until that point, she had been demonstrating that her ability to speak, among other skills, was returning. And in resigning, she spoke about speaking on behalf of her constituents, one of an elected representative's most important public roles.“I don’t remember much from that horrible day, but I will never forget the trust you placed in me to be your voice. Thank you for your prayers and for giving me time to recover. I have more work to do on my recovery, so to do what is best for Arizona, I will step down this week,” she said in a video message to her constituents. 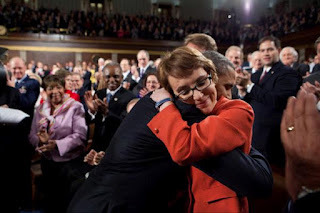 Given the limits on her ability to speak, what would have been Giffords' resignation speech was broken into two parts: The video message, which was widely released online, and the reading of a resignation letter on the House floor; both are embedded below. For the reading of the letter, Giffords' friend and colleague Rep. Debbie Wasserman Schultz did the honors with Giffords standing by her side on the House floor, surrounded by the Arizona delegation. Before her resignation was read into the record, the House--in a rare show of bipartisan agreement--unanimously approved legislation she had proposed to fight drug trafficking along the U.S.-Mexico border. Members of Congress were moved to tears during the reading of Giffords's letter, as was its reader. "From my first steps and my first words after being shot to my current physical and speech therapy, I have given all of myself to be able to walk back onto the House floor this year to represent Arizona's 8th Congressional District. However, today I know that now is not the time. I have more work to do on my recovery before I can again serve in elected office," Giffords said in the letter. What can you learn from this famous speech? When you can't speak, ask someone to be your voice: You don't have to go through what Giffords did to ask a surrogate to speak for you. Whether you are overcome with emotion at a funeral, unable to face the crowds and the press corps after a court appearance, or unable to speak physically, you still may find it important to have a voice. So borrow one. In Giffords's case, the speaker-surrogate had to be another member of Congress in order to speak from the floor; in your case, you should choose a trusted friend, colleague or family member. Know your limits: Even the best vocalizer shouldn't speak too long, but when your health is a factor, keeping your remarks short is smart. In this case, Giffords speaks only briefly in the video message, leaving a more detailed message for the reading of her resignation letter. Your audience will understand and appreciate the effort, no matter how brief. When words really matter: When brevity is a must, every word counts. If your spoken words can only be a few sentences, what will you say? What are you able to say? What can someone else say for you? What can be left unsaid? All those are the questions you need to consider in such a situation. Be forthright in speaking to your abilities: Relearning speech has been a major hurdle and accomplishment for Giffords, and this twinned "speech" makes plenty of references to her condition and ability--in part, because it's a reason for her resignation, and on the minds of her listeners. But referencing speech and speaking allows her to reference being a voice for the people and her efforts to recover. In so doing, Giffords reminds us all that one of the primary jobs of an elected representative is public speaking--not only with her words, but her effort to speak them. Giffords's video message and the reading of her resignation letter are in separate videos, below. What do you think of this famous speech?